If you are going to be successful planting something to grow food for you for this year and have it provide seeds for next year, you must first give it a good home so it will grow well for you. 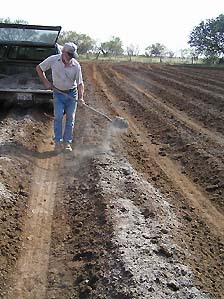 This is not easy and usually involves more than a little work preparing the ground, either with shovel and garden fork or a tiller of some kind since garlic needs beds at least 6" deep. Garlic likes the soil to be loosened up down to about six inches or more and to remain loose so that it feeds and waters well and its roots do not get needlessly torn up when harvesting - it's best to minimize any physical damagge during harvesting as nicks, cuts, broken roots, etc. provide pathogens a place of entry to contaminate the garlic. You may not need to make raised beds if your garden soil is sandy loam or a sandy soil enriched with lots of organic matter and it is loose enough deep enough to be well drained and for root crops to be easily pulled out without damage. When we lived in town and had only a small 12X24' garden I used a shovel, garden fork, rake and hoe to do all the work but when we moved to the country and had a garden almost the size of a football field, a tiller was a must. Merridee's family had a big heavy Troy-Built that churned up the soil pretty good and could build a bed fast although it would jerk you around and rattle you pretty good when it hit a hard spot. A big tiller is an indispensible tool for a large garden and I wouldn't part with the Troy-Built but it quickly became obvious that we needed a smaller more more maneuverable and easier to manage tiller for the smaller jobs within the garden and it had to be light enough for Merridee to carry and use. We looked at the alternatives and bought a Mantis tiller in 1994 and used it to till smaller beds and weed between beds because it was lightweight and maneuverable and saved backbreaking hours in the hot sun with a shovel, scuffle hoe or 4-tine hand cultivator. I don't even pretend to be any kind of expert on gardening but I have gardened by the seat of my pants for 35 years and have made a lot of mistakes but seem to have overcome most of them and have grown some pretty good garlic the last 15 years. I have developed methods which have worked well for me here in west central Texas and that's all I can discuss from personal experience but I hear a lot from northern growers and I repeat what the more successful ones say. We live near a creek and our garden soil is all fine silt, which in the absense of organic matter, compacts. I till and build and fertilize raised beds three months before I intend to plant garlic. I then mulch them with thick layer of hay/straw/alfalfa, grass clippings, etc. and hand water heavily, enough to mat down and thatch together the mulch cover and let it intertwine so it doesn't blow away. Then I let it set untouched until time to plant so that the microbial life in the soil can do its thing and produce a living fertile bed with a chocolate cake-like texture. In Texas, bare ground gets baked by the sun and dehydrates the area around it but a cover crop or organic mulch holds the moisture in and maintains plant health. When it is time to plant I rake back the mulch, plant the bed with the garlics planted 6" apart, run and anchor the irrigation tapes (two to a bed) and rake back the mulch and add to it and then water to saturation to matt the mulch . Thereafter when it is time to water I irrigate with creek water through the drip tapes. Building the beds is the hard part because there is a lot of hard labor involved.